Boulder City High School girls golf team is riding into the postseason with a lot of confidence after dominating league play throughout the regular season. Robert Vendettoli/Boulder City Review Boulder City High School junior Eugenia Kryshchuk exchanges a series of swings with Eldorado on Sept. 27, 2018. She won her game. Despite failing to qualify as a team in their last league matchup at Las Vegas National due to participation numbers, the Lady Eagles still claimed the top three spots. Senior Ryann Reese placed first with a score of 88 on the par-72 course. Junior Sydney Krumm and sophomore Paige Rudd finished second and third, respectively, with scores of 94 and 114. Finishing first again on Sept. 27 at CasaBlanca Golf Club, Reese led the Lady Eagles to a league victory with a team score of 365. Chaparral (542) and Sunrise Mountain (562) finished second and third. Placing first in each league match this season, Reese shot a 81 on the par-72 course. Sophomore Riley Shuman (92), Krumm (92) and junior Makaela Perkins (100) finished second, third and fourth to round out the Lady Eagles’ core. Prepping for the 3A Southern Regional tournament, the Lady Eagles will travel to Mesquite, Nevada, for a two-day event starting Tuesday, Oct. 9, at The Palms. Round two of regionals will conclude Wednesday, Oct. 10, at CasaBlanca Golf Club. 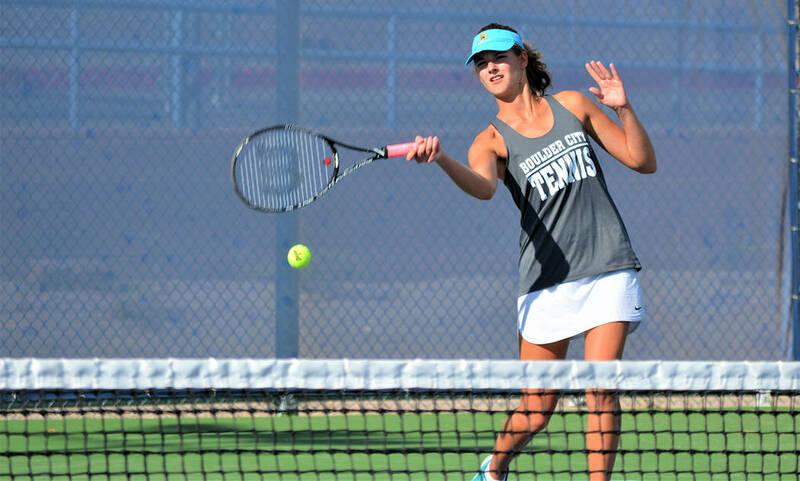 Ending the regular season on a 15-game winning streak, Boulder City High School girls tennis team dominated 4A Eldorado 17-1 on Sept. 27. Senior Olivia Goodfellow finished 2-0 in singles play for the Lady Eagles (15-1), while the doubles duo of senior Natalie Bowman and junior Katelyn Fox finished 2-0. All playing one match before taking a seat, junior Olivia Mikkelson and freshman Reggi Gibbs finished 1-0, while juniors Tegan Pappas and Eugenia Kryshchuk finished 1-0. Junior Sophia Morris won two doubles matches, one with junior Olivia Leavitt and the other with senior Heather Patterson. Rolling into postseason play, Boulder City will host Valley today, Oct. 4, in the first round of the 3A Southern Regional tournament. Boulder City High School’s football team suffered its first loss in a month, falling to 4A Desert Oasis 21-12 on Friday, Sept. 28. Previously riding a four-game winning streak, the loss was out of conference and will not affect the Eagles’ postseason standings. Trailing 21-0 at the half, the Eagles put forth a better effort on both sides of the ball. Shutting the Diamondbacks out offensively in the second half, senior running back Thorsten Balmer made the game respectable with a pair of rushing touchdowns. Scoring on a 1-yard run in the third quarter and a 10-yard run in the fourth quarter, Balmer rushed for 120 yards on 23 carries. Finding mixed success with the passing attack, junior Parker Reynolds finished the night 9-of-22 for 140 yards, connecting with sophomore Deavin Lopez on three passes for 70 yards. The Eagles will host rival Moapa Valley on Friday, Oct. 5, in a battle for first place in the 3A Sunrise standings. Boulder City High junior Audrey Selinger led the way in Friday’s, Sept. 28, Falcon Invitational at Foothill High School with a 19th-place finish out of 84 runners in the junior-senior race with a time of 22:42.9. Creating a strong core for the Lady Eagles in the upperclassman race, junior Sarah Oberweis (24:37.9) finished 33rd, while senior Aylssa Williams (24:45.6) finished 36th. In the freshman-sophomore race, freshman Mary Henderson finished 22nd out of 114 runners with a time of 22:47.8, while sophomore Sophie Dickerman finished 28th with a time of 23:24.5. Running strong for the boys, sophomore Sean White finished 34th out of 141 runners in the freshman-sophomore race with a time of 19:57.1, while Seth Woodbury (20:17.4) finished 44th. Senior Justice Tilman finished 59th out of 174 runners with a time of 19:55.9 in the junior-senior race. The Eagles will compete in the Lake Mead Invitational on Saturday. Results from the Eagles’ home Wednesday, Oct. 10, weekday race will appear in next week’s issue. Boulder City High School boys soccer team dropped a pair of league contests this week to Chaparral on Sept. 26 and Sunrise Mountain on Oct. 2. Shutout in both games, the Eagles (4-5) fell to the Cowboys 8-0 and the Miners 10-0. Boulder City will host rival Moapa Valley today, Oct. 4, and Virgin Valley on Monday, Oct. 8. Boulder City High School girls soccer team picked up its first league win of the season Sept. 26, routing Chaparral 8-1. Putting on an offensive showcase against the Cowboys, junior Makenna Arboreen led the way for the Lady Eagles (2-5) with a pair of goals, while juniors Keely Alexander, Madison Manns, Trinity Oeland and Erin Taggard each scored a goal. Sophomores Valerie Henderson and Sophia Legat also scored goals against the Lady Cowboys, while senior Elizabeth Taggard, Arboreen and Trinity Oeland each supplied two assists. Mustering up a great effort Tuesday, Oct. 2, against Sunrise Mountain, the Lady Eagles continued their strong play but were unable to come away with a victory, falling 3-2. Manns scored a goal on an assist from Trinity Oeland, while Legat scored on an assist from senior Maggie Clary. Boulder City will travel to rival Moapa Valley today, Oct. 4, and Virgin Valley on Monday, Oct. 8. Thursday, Oct. 4, team semifinals at Boulder City, 3 p.m.
Friday, Oct. 5, team final at Boulder City, 3:30 p.m.
Saturday, Oct. 6, Lake Mead Invitational at Veterans’ Memorial Park, 8 a.m.
Tuesday, Oct. 9, O’Dea Frosh-Soph Invitational at Desert Breeze, 4:30 p.m.